Before we dive into detail about hazing, we need to understand exactly what the meaning is. I myself did not fully understand it, so I decided to do some research. When people have a question, they use Google. It has given me countless definitions of words before, but it failed when I asked what the definition of hazing is. Like usual, I found a hundred different sites consisting of definitions. What is unusual is that every definition is different. When you read the title of this article, automatically you have your own idea about what hazing is, and that is the problem. Everyone, even the administrators of schools have a different “idea” of what hazing is. Hazing is: forcing (a new or potential recruit to the military, a college fraternity, etc.) to perform strenuous, humiliating, or dangerous tasks. Notice the key word in the beginning is forcing. There are two ways someone can be forced to do something. One could physically make you do something, or they could threaten or peer pressure you into doing something. There are a lot of times when hazing has not been going on, yet some people still think it is. Before the word “hazing” comes into play, one needs to realize who is being forced, and if they are actually being forced into doing something. A lot of the times, leaders or people of seniority aren’t doing any forcing at all. A few examples come to mind, one in which I was a part of. My freshman year, the captains of the football team asked us if we wanted to wear our game pants to school. We thought it would be funny, and decided to do it. There was one or two that forgot or didn’t want to, and they were not forced to wear them, or “punished” for not wearing them. Knowing this information, the administration probably would not have been so quick to reprimand the people of seniority on the team, but it happened anyway. Every freshman was called into the office along with the captains. We sat there trying to explain to the administration that it was our choice to wear the pants, but they wouldn’t listen. The key part of hazing is the force involved. In this situation, we as freshman were basically told that we had been hazed. How could we have been hazed if there was no force involved? Another, very recent example happened with the girl’s soccer team this year. The basic story of it is that the freshmen on the team wore their uniforms for the first game. This includes: Jersey, shorts, shin-guards, and socks. I interviewed a senior on the team who preferred to remain anonymous, and I received some new information on the subject. We will refer the anonymous girl as Tina. When asked for some background behind this whole event, Tina said “Every year we introduce the idea of having the freshman girls wear their whole uniform, minus the cleats, for the first game day.” She said that this tradition has been going on for longer than she has been at high school. Tina says “Freshmen were excited to wear their uniform; they wanted to show that they were a part of the team.” The leaders of the soccer team were very confused on why it was such a big deal since it has been a tradition, and there was no hazing going on. Some speculation was that if girls didn’t wear their shin guards they would be kicked by the seniors, but Tina said that no one had threatened any freshmen at all, never mind with kicking them. “It wasn’t malicious, just innocent fun. It was a tradition; we didn’t see any reason to change it.” Now, how is this considered hazing? No one is being “forced” into doing this, or threatened to be cut from the team, and without force there is no way that hazing can happen. Hopefully this article will make everyone more aware on what hazing really is, and how better to avoid it or catch it before it happens. This was: Let’s get real with Nick Sneider, thanks for reading! 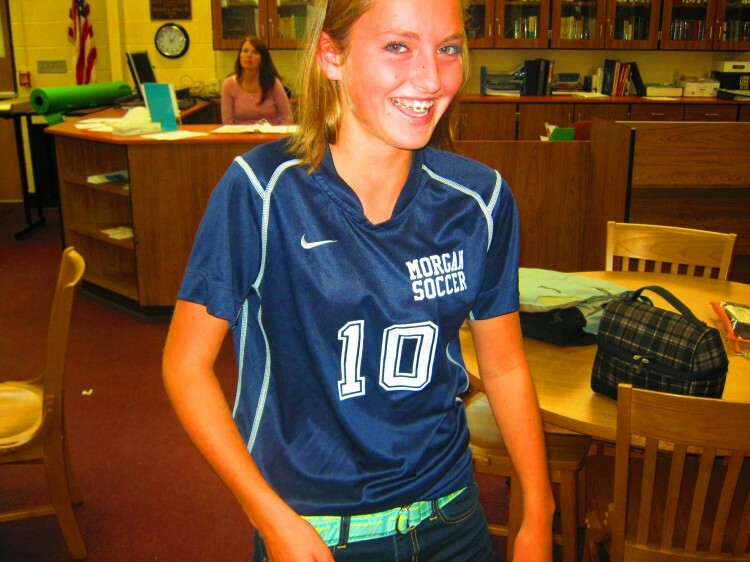 A happy looking freshman on the girls soccer team! I’m Elvis from Hempfield High School’s newspaper, The Flash. I really like your article. Our school has never done a story on this, but this is something that’s very common and hardly talked about! Great job! Reblogged this on Hazing Today.